(minimal PR work performed at this time due to my aversion to cigarette smoke. In addition, I maintain an Internet email database of media and webpages. 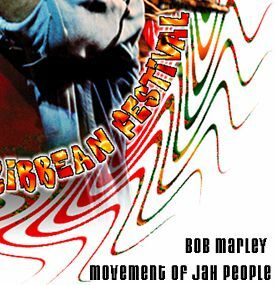 This festival, which is produced by Bob Marley's family, is in its 8th year. 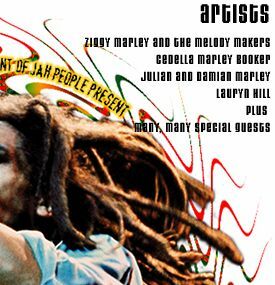 Bob musical members of his family perform, and special guest artists, such as Burning Spear, Morgan heritage, Erykah Badu, Carlos Santana and Lauryn Hill highlight the festival. and recognition of, the young ladies of Haitian heritage living in Miami. On the Miami River, this art-filled, laid-back site has great Spanish food and concerts. 1998 Miami New Times Awards. 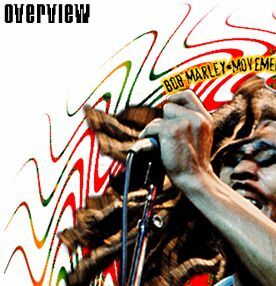 A number of my articles are at the Jammin Reggae Archives. I authored a 16-PAGE SUPPLEMENT that publicized the MIDEM/MIAMI Caribbean Music Market . If you would like text copy of my articles, email me. Feature Stories: Aterciopelados, So Pra Contrariar, DJ Laz, Third World and Brave Combo. "Tito Puente, Jr. - Prince of Latin Dance"
"Ky-mani Marley and Tito Puente Jr. "
"ReggaeSoca Awards - The Miami Experience"
"ReggaeSoca Awards - The Stars Shine"
"MIDEM Miami"-- the Jamaican presence"
History lessons in reggae and Latin music -- one hundred years from now -- may point back to the day in September 1997, Miami, Florida, the Midem Music Conference. 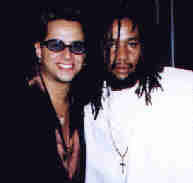 At a shared press conference, Ky-mani, son of Bob Marley, "King" of Reggae music and Tito Puente Jr., son of Tito Puente, " El Rey" of Latin Jazz, declared their mutual respect for each other and announced to an interested journalists that they would put out a single together. But I'm getting a little ahead of the whole story, which unfolded unexpectedly, beautifully, in front of a pleasantly surprised crowd ….. Noon: The huge room where the shared press conference featuring Ky-mani and Tito Puente Jr was empty. Almost 200 chairs were lined up, silently waiting for the press. Tito entered first, chatting with someone from his record company Compose Tropico. Everything was mellow, soon come, Miami Latin/reggae style. A few more people came in, including Ky-mani with some reps from his record label, Shang. He and Tito greeted each other, and quietly talked to each other. Slowly, the room started to fill. The crowd was definitely divided into two friendly camps -- the Latin music press and the Reggae music press. Let the linguistic games begin. Patois/English/Spanish, ahhh, Miami. Murmurs of potential questions were heard, and it was evident that the press representatives didn't want to dis the "other camp's" artist by not asking them questions, but a common ground, other than they are the sons of musical giants, wasn't evident. One silly question aimed at the two artists was "Why do you use your famous name?" The crowd and the artists burst into laughter, and the quick answer from Tito said it all: "It's the name on my driver's license, what else can I do?" Ky-mani just smiled, stayed quiet, taking in the bemused response of the audience. What can a man do? Obviously, the questioner didn't know that Ky-mani doesn't use the Marley name, he prefers to just be known as Ky-mani. Even as they answered the press' questions, Ky-mani and Tito interspersed their answers with questions and statements to each other. It was obvious that they related to each other on many levels. Tito explained that the night before, in the rehearsal studio, he discovered that Ky-mani was in the studio down the hall. They hooked up, introduced themselves at that time, chatted a bit, and now were following up, in public, for all the world's press to see. They have more in common that a famous father. Both are in their early-mid twenties. Both were raised in the US, Ky-mani moving here at age 8, Tito born and raised in New York City. Both began their musical development with percussion instruments, a choice that shows their interest in de riddim/el ritmo, a unifying force in Afro-Caribbean music. Their careers are just a few years old, and both have evolved their musical philosophies in those few years, emerging with their own distinct styles. Ky-mani used to do a lot of dj-ing on stage. 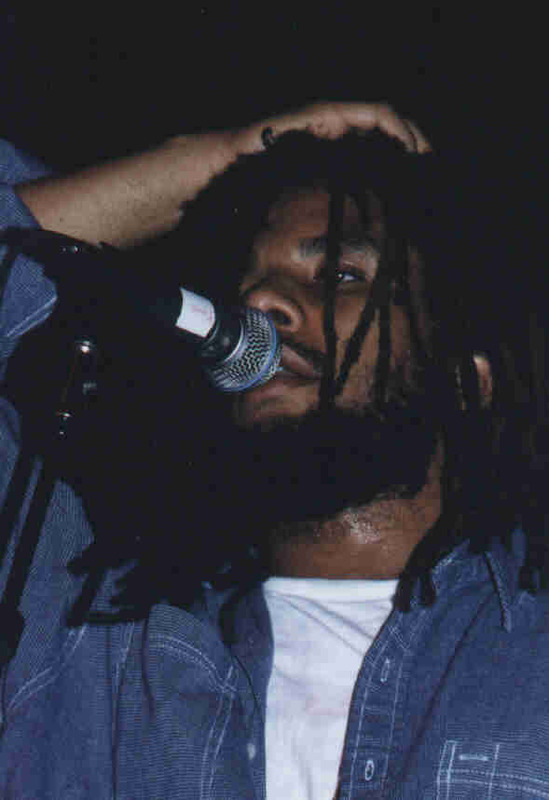 When he sang you marveled at his voice, so evocative of Bob. 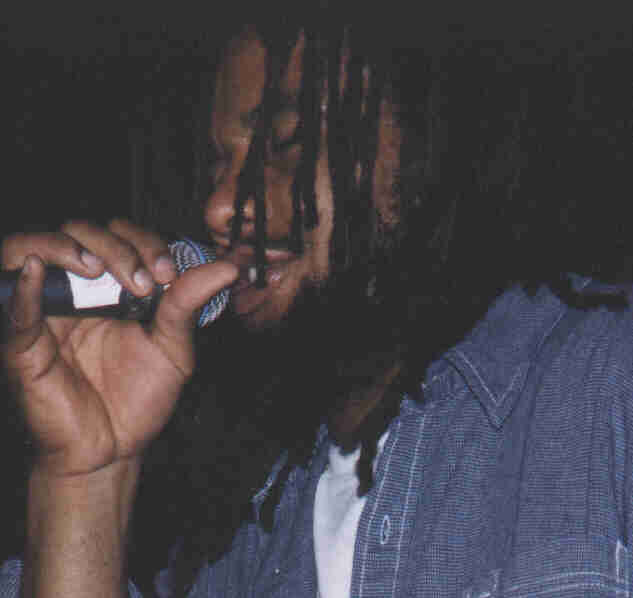 A question from the audience was about the stylistic blend of dj-ing in a hip-hop manner and the rootsy singing, and whether he would still blend the two at that evening's performance. Ky-mani replied that he pretty much does what the spirit moves him to do on stage (which turned out to be singing, no dj-ing at his performance). Tito explained to the press that his musical niche is quite different from his dad's. His dad, the King of Latin Jazz for 50 years (1997 was the anniversary of Tito Sr.'s 50 years in music, marked by many celebrations, a special boxed CD set, and many awards) provided the Latin foundation for Tito JR's music, but the Boy from New York City writes and performs what he terms "Latin Dance". Tito's music is fast, rhythm-charged, hip-hop, salsa, meringue, street-wise and full of on-stage showmanship in the Latin tradition, with gymnastic dancers (including Tito, who does cartwheels, leap-frogs and other athletic movements). His two videos, from his two hit singles "Guarachando" and "Oye Como Va" show his in-your-face style to its best advantage. When you go to a Tito Jr. show, expect to be dazzled by his music and the movements. Ky-mani, in a follow-up phone interview, stated that he was aware of Tito's music from the radio, but didn't get a chance to catch Tito's performance the night of the press conference. The two had made plans to try and see each other's show, but the pressures of the Midem schedule kept them from accomplishing that. Ky-mani was provided with a video of Tito's performance, the two videos and a TV interview to bring him up to speed on the style of his new friend. As the two chatted, almost as if they were alone, not in the midst of a large press conference, the audience began to feed on the good vibe flowing between the two men. Questions about the proposed collaboration on a single raised everyone's expectations as to the final product. "Oye como va, el ritmo" translates to "Listen, this is how it goes, the rhythm", a phrase that is probably amongst the best know in Latin music. At press time, Tito and Ky-mani have been able to meet a few times in the rehearsal studio, and have spoken with each other several times on the phone. A single is definitely in the works, a duet between two second-generation musical sons that will probably be one for those history lessons a hundred years from now. Reggae meets Latin Dance. 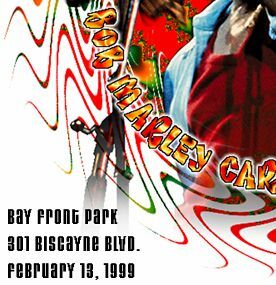 You heard it here first, 1997, Miami, Midem. History in the making. Rated *Exceptional* by the Miami Herald. The mirror-heeled "shoe" is actually a working gondola, see press release, below. The black and white horizontal elements are recycled tires, also used as planters. a unique dining experience on the Miami River. The seafood/shellfish/vegetarian menu contains enough freshly-grilled and creatively-prepared food at reasonable prices that the Brickell Ave.-friendly spot can fulfill any diners desires, from Paella (the house specialty) to Florida lobster. The menu reflects the culinary expertise of the chef/owner, Montse Guillen. Montse opened a wildly successful tapas restaurant in New York City in 1985, El Internacional. She is credited with starting the tapas trend in the United States with the tasty Spanish tidbits she presented to the jaded New York City palates. Montse has been a much-sought-after chef and special events professional on South Beach for the last five years, working her magic at the Shabeen Restaurant at the Marlin Hotel, and at numerous public and private foodie experiences. Montse was the coordinator for the two Africa Fete concert/African village events on South Beach, and also started the Espanola Way weekend food/market events. The Mayaimi in the name reflects the diaries of a shipwrecked 16th Century Spaniard, and his interpretation of the Indians names for the area. 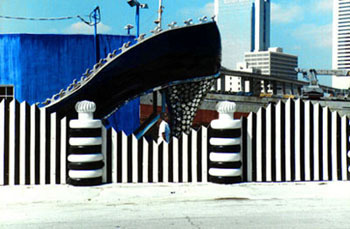 Spanish artist Antoni Miralda researched the site and pays homage to the heritage of the Miami River with nautical themes that tie the waterway back to the Old World -- his "Gondola High Heel" is stationary now, but once plied the waters in front of the Bridge of Sighs. A nod to the history of the river will also be found in the landscaping -- coontie plants, once a starch staple of settlers, milled by the waterpower of the river, will be found in the garden. And, the landscaped area of the Bigfish Mayaimi can surprise you once you enter the fence made of wood and recycled tires (Yes, another visual surprise, the tires used as planters!) because it is BIG. The grounds extend 200' east to the Miami River Bridge, and include picnic tables and dining on the lawn. Many flowering and fragrant plants are the predominant feature of the landscape. Coontie plants, the original starch plants of the Indians and pioneers are also on site, harkening back to the days when coontie mills were located along the river. During lunch and dinner, the diner's eyes move from one visual interest to another - the skyline of downtown, the Metrorail (especially at night, when their bridge is lit with neon), the planes flying in the distance, the constant movement of traffic on the Miami Avenue bridge and I-95, and, of course, the boat traffic. Instead of a happy hour , the Bigfish features a Sunset Hour, when the frequently-spectacular color-drenched sky provides a languid backdrop for the tasty tidbits and beers and wines that the office-weary downtown worker can enjoy. Just blocks from Brickell Avenue, and nearby the Miami Avenue Bridge, just off 5th St. South, the Bigfish Mayaimi is easy to reach and enjoyable to visit. Few spots in Miami can offer all of the fun and waterfront experiences of the Bigfish. Come and enjoy the food and the view and a little bit of Miami history.